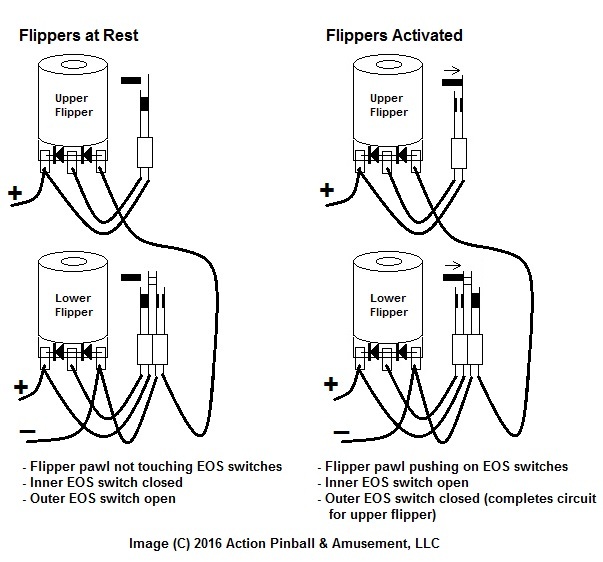 This article explains the correct wiring for flipper EOS (end-of-stroke) switch wiring for dual (upper & lower) flippers used on some early Bally and Stern solid-state pinballs 1977 through 1985. Bally games that used dual flippers on one side (or both sides) of the playfield, were Cybernaut, Eight Ball Champ, Eight Ball Deluxe, Flash Gordon, Future Spa, Harlem Globetrotters, Hotdoggin', Kings of Steel, Paragon, Space Invaders, Spy Hunter, Vector and more. Stern games that had dual flippers were Big Game, Cheetah, Lightning, Meteor, Seawitch and more. Some other makes/models may use similar designs, such as Williams Contact and Flash. Others did not, and instead used separate flipper coil wiring with two contacts on the flipper button switch in the cabinet, instead of using a 'dual' EOS switch on the lower flipper like Bally and Stern did. Some examples of this were Williams Black Knight, Black Knight 2000, Jungle Lord, Laser Cue, Pharaoh, Solar Fire and more. Proper wiring with notations for game wire colors are usually found in your game manual in the wiring/schematic diagram section. Manual wiring diagrams can be a bit vague, so please refer to our diagram below for a more visual layout of the correct wiring for dual (upper/lower) flippers. Take note of the position of the EOS switches on both upper and lower flippers when in both the rest, and activated positions. Switches must be installed and adjusted correctly in your game so that they are open and closed properly in both states (at rest/activated) as shown in the diagram above. When checking the adjustment of your switches, you can push the flipper coil plunger into the coil so that it pulls the crank and the crank pawl activates the EOS switches. Do this, and check to make sure the switches are opening/closing correctly when the pawl hits them, and lets them go back to rest position. Do not push the crank/pawl on it's own- use the coil plunger to move it instead. Any excessive 'play' in the parts from wear/tear can give false readings. Pushing the coil plunger all the way into the coil until it stops, and letting it pull the linkage and crank to activate the EOS switches is the proper way to make sure everything is working right. If your flipper parts have too much wear/tear in them, they may not be able to activate the EOS switches properly, and you may need to do a flipper rebuild. Note that the upper flipper is activated when the lower flipper has been fully activated, and it's outer EOS switch contacts have closed. This completes the circuit for the upper flipper coil, and allows it to activate. This is the key to making upper flippers work in unison with lower flippers. Check your wiring against the diagram above carefully. There are many ways to get the wiring wrong, but only one way to get it right. Wire colors may vary from game to game, so none are shown above. Wire colors don't matter as long as everything is coming from, and going to, the right place (wires may have been repaired/replaced in your decades-old game, so may not even be the original colors...) Refer to your game manual if you need to determine exact original wire colors. Note that when an EOS switch is 'open', it should be open approximately 1/8 to 3/16 inch. Any more or less may cause incorrect operation. Note that when an EOS switch is 'closed', it should be firmly closed so that the contact points are making good solid firm contact. Some fine-tuning and delicate adjustment of the switches, along with healthy and properly-installed flipper parts, will yield correct results. Diodes mounted between the solder lugs on the flipper coils have polarity ('+' and '-' ends) and wires must be connected to them in reference to how they are mounted on the coil, otherwise they can become shorted-out and you'll blow fuses every time you activate the flipper, and end up having to replace parts and do some repair work on the coil. Diodes have a silver band on one end, and no band on the other. The end with the band is the 'cathode' and is the positive (+) end. Power wire will always connect to the cathode end of the diode. The end without a band is the 'anode' and is the negative (-) end. Ground, or 'low side' of the circuit is always at the anode end. If you're not sure which wire going to your coil is the game's power (+) wire, refer to your game manual to determine wire color, or with power on, carefully measure between the suspect wire, and a ground point (metal chassis on cabinet) to see if you have positive voltage on that wire. If so, that's a good indication that you have identified the power wire (should show approx. 43vdc in Bally and Stern games).